Incepted in the year 1995, Dr. Gahukar’s ayurved panchakarma instrumental engineering is a partnership based firm involved in manufacturing and providing services of various panchakarma equipment. 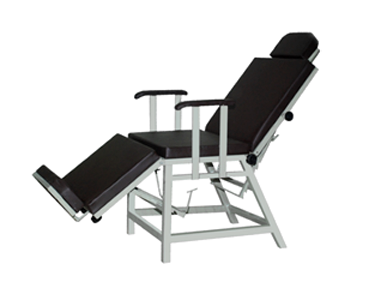 Being a dynamic company our intention is to design quality panchakarma equipment. To ensure that our customers are benefited, we assist them with qualitative range of products. Over the 25 years of Dr. Dhanraj gahukar & Dr. Jyoti gahukar s practical experience has helped us to design our instruments. They have motivated us at every step to conduct business on ethical grounds. 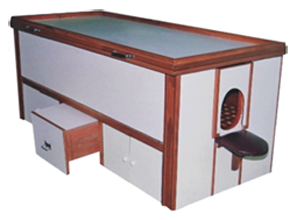 Our equipment are made using quality teak wood, laminated ply, electronic components, ss covers, and other allied materials we manufacture a wide spectrum of panchakarma equipment like vaman yantra, virechan yantra, droni, abhyanga table, sarwanga baspa sweda (lying and sitting),kuti sweda, dhara yantra, nasya chair, ksharsutra yantra etc. Which finds extensive application in ayurved panchakarma setup. We possess a team of experienced engineers and technicians who are the back bone of the company. Their constant hard work at every step has made us achieve success. Our total work force has left no stone unturned to create a difference in all the procedure right from manufacturing, quality control, planning and customer service. We lay stress on the quality at various stages right from the procurement of the raw material till the final shipment of the finished product. A specially designed chair made up powder coated steel pipes with multiple adjustment and fitted with high density foam for better comfort. Back and head rest adjustment provide different position for nasya. Leg and foot rest adjustment for relaxation. Ideal for Nasy therapy and can also be used for raktamokshan, Ksharsutra, and as couch. 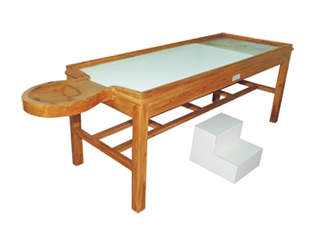 A laminated top massage table with rimmed edges and slant toward foot end finished with steel finish and fitted with valve for oil collection. 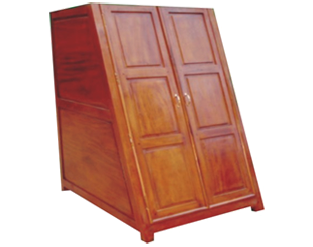 Head end is slightly curved inside and has slant at center with rimmed edges carved in teak wood. 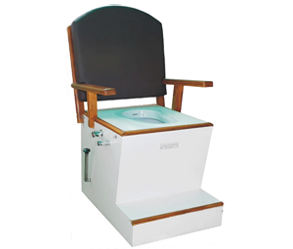 Full-body steam bath, made of water resistance Hard-wood designed as a box for patients to have steam bath in lying down position. Patient's head rests on wooden pillow out side the chamber and body rest on wooden mesh inside the box. The lid opens on hinges for convenience of the patient to enter. Steam is generated in boiler & spreads uniformly inside through pipe which can be controlled with steam flow valve.A Gas stove can also be kept below the mesh. Laminate finished top with rimed edges which can be used as massage table. 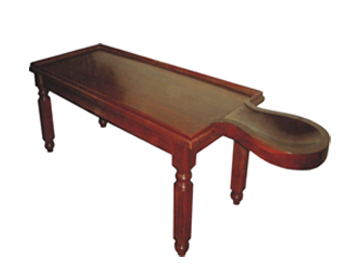 Dhara Table with melanin wood polish finish, massage table has a slanted and curved Teak-wood top for full body oil message.Head end is round with side rims and slant toward centre. 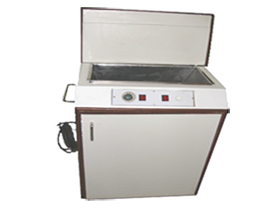 Dhara Yantra mounted on iron comes with laminated finish fitted with stainless steel sink for Oil Collecting, and Heating arrangements of the oil/ water and motor pump with 3 speed flow for massage. 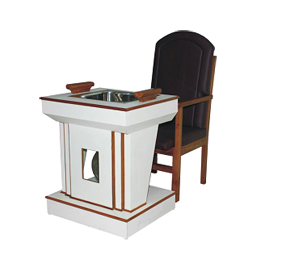 Yantra is fitted with 1Kw heater and a thermostat to maintain the temperature for soothing and relaxant massage. Yantra is mounted on heavy duty wheels for easy mobility. 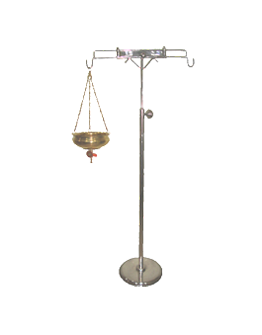 Shirodhara Patra is wide mouth stainless steel or brass pot with nozzle at bottom and fitted with chains to hang patra on shirodhara stand made up of stainless steel or teak wood.